If you’re familiar with my life, which maybe you are, maybe you aren’t, you would know last year I took a six-week trip to Italy on a whim. It ended up being one, if not the best, experience of my life. 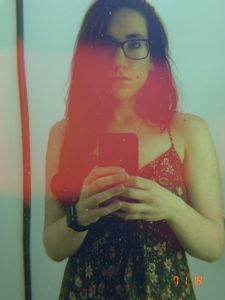 Earlier this year I took a semi-spontaneous trip to visit my brother again in Phoenix, but the travel bug bites, and it bites me exceptionally hard. Now, this year I’m not as fortunate to be able to take a big trip like that due to several factors. However, one of my best friends Alex had just moved down to Washington D.C. She’s there alone for a few weeks before her boyfriend moves down for graduate school, so she’s been a bit lonely. About two weeks ago the idea popped into my head to just go. I booked my flights and flew there on Monday, July 13. I returned early yesterday, the 16th. 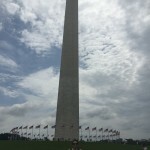 We fit a lot into 3 days and it was my first time to visit the capital. After picking me up from the airport, we stopped quick at her apartment to change and freshen up and walked down to the bus station. The bus ride was a quick ten minute ride to the Pentagon metro station (not to be confused with the Pentagon City station -as she explained). Even during rush hour times the trains never seemed full. As a New Yorker who has commuted on multiple occasions I was astonished that people didn’t need to pack in like sardines. All the trains did seem a bit outdated, there was no ticker overhead announcing what stop was next or a light-up map either. So you do need to pay attention to the stops. I have to wonder what is at the Foggy Bottom stop. Also, the regular fair cards (not the Smartrip cards) don’t tell you how much is left on your balance. And the metro prices on how far you are going so you pay for how many stops rather than just to use. 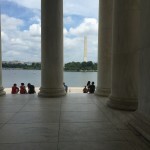 We took the metro right to the National Mall, which is under construction in places. We stopped in the Smithsonian Castle and then headed to the top two museums on our lists (she had been to both before, but they are a must!) I kept getting these names mixed up, but apparently everyone does. 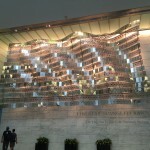 First we viewed the National Museum of American History, which had great pieces. 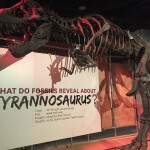 The Smithsonian does a superb job of curating. One of my favorite Periscope users is an archaeologist who always talked about being ‘edutained,’ and I certainly felt edutained walking out. 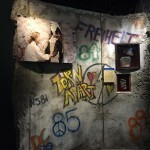 This museum has such a wide-range collection, from George Washington’s swords to First Ladies gowns, a slab of the Berlin Wall, and different presidential mementos. 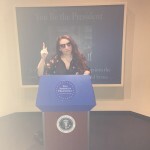 There’s definitely an embarrassing video of me at the presidential podium giving John F. Kennedy’s inaugural speech. That won’t be shared here, but look for the picture. 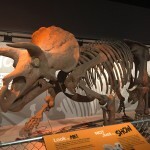 The next museum was the Museum of Natural History. 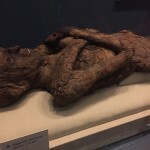 Another amazing museum. 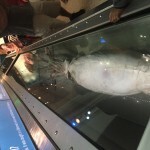 They have Harry Winston’s Hope Diamond, an Ancient Egypt exhibit and an oceans exhibit among many others. The only exhibit I wasn’t crazy for was the taxidermy animals. I especially enjoyed the Bollywood and African exhibits. It pushes the boundaries of what you thought you knew. We rounded out the first day with a visit to the National Archives to see the Declaration of Independence, the Constitution, and the Bill of Rights. There are no photos allowed in the Rotunda which is for the health of the documents. It was an amazing experience to be in the same room as the most important documents in US history. The Founding Fathers were so intelligent in understanding that times change and so do people’s mindsets. 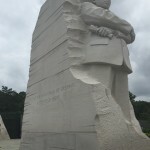 What may have not been okay twenty years ago, is commonplace today, and I think we all need to realize that our freedom is in place to protect everyone’s ideals. 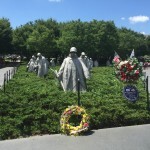 The next day we strapped on comfortable shoes and walked the National Mall, visiting almost all of the monuments, the Washington Monument, the Jefferson Memorial, the Lincoln Memorial, the Korean War Veterans Memorial, the Vietnam War Veterans Memorial, Martin Luther King Jr., FDR, World War II, and several others. 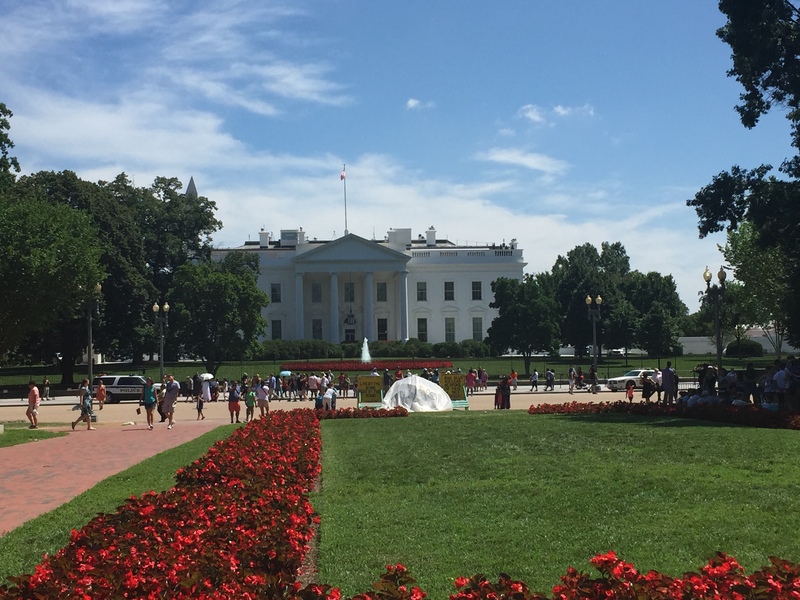 We also stopped to visit the White House, which looks so different in person. 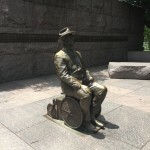 While these monuments evoked a sense of reflection and humbleness in me I couldn’t help but think about what could be next. The third day we took it easy and enjoyed the sweet peacefulness of her town and doing things we normally did when we lived together in college (i.e. : gossip, watch weird/bad movies, and eat food). 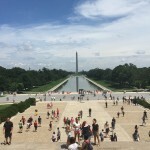 There are plenty of things I still want to do in D.C., like visit many of the other Smithsonian museums, and other museums like the Spy Museum, the Newseum, and the Writers Museum. I would also love to visit the Library of Congress, the Supreme Court, the Capitol, the Ford Theatre and Arlington National Cemetery. 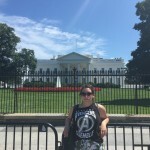 D.C. is one of those places where you can always return to something new, and it is something I look forward to when visiting Alex down there over the next few years. After Valentine’s Day I visited my brother and his fiancé for 10 days. I was originally gonna stay 5-6 days, but I extended it to 10 after having so much fun and bad weather in the New York area. He lives outside of Phoenix. 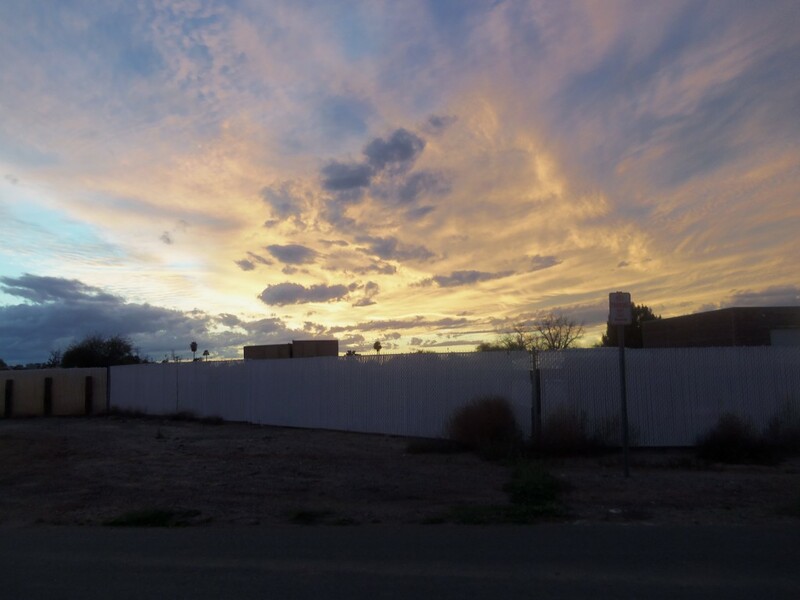 I had visited Arizona first in 2010 and we went up to Sedona, down to Tombstone, the Phoenix Zoo, Superstition Mountain, and a couple other touristy things. This time around I visited the Out of Africa Wildlife Park, which was one of my favorite experiences. They rescue exotic animals that people have kept as pets or from overcrowded zoos. I got to feed a tiger. I heard hyenas laugh (and moo, yes they moo!). I also fed giraffes by putting a lead between my lips and having them take it from there. 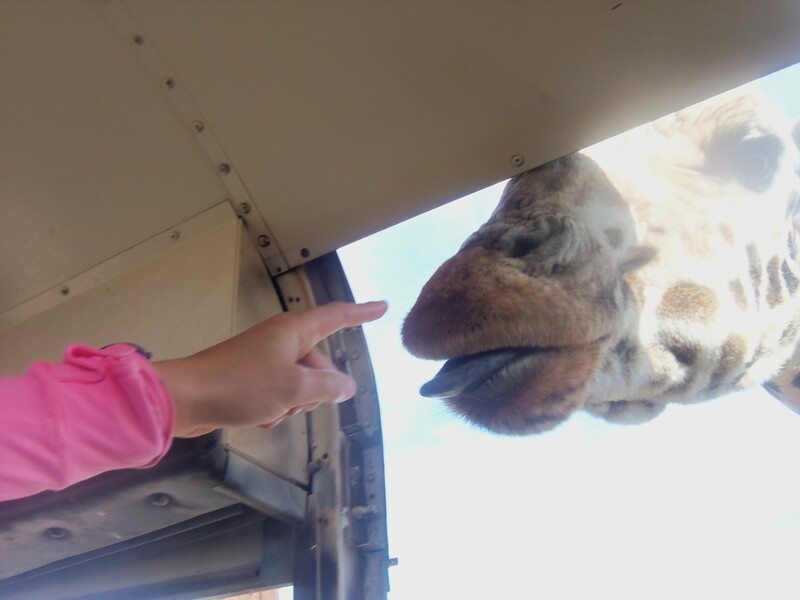 A lot of people ended up getting the giraffe’s tongue all over their face but both the giraffes I fed like this were gentlemen. We went to the Arabian Horse Show and watched a jumping contest which was thrilling. Horses are incredible. My brother took me to the Arizona Renaissance Festival which was amazing. 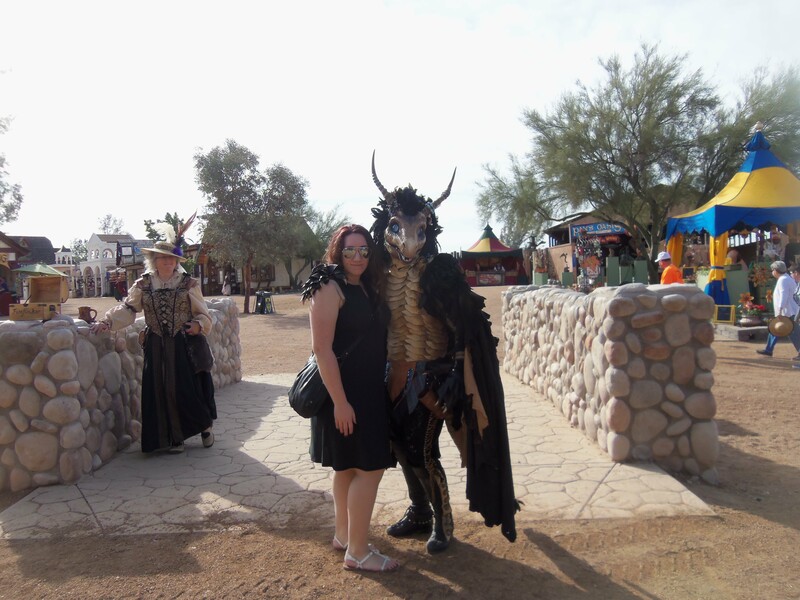 I had never been to a RenFaire before and it was super fun. The shows, turkey leg, mead, and vendors were all cool. 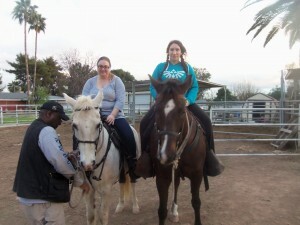 We went horseback riding on the day I was supposed to originally fly out. Our family friend Herb owns them and after letting us walk around the corral we took to the streets. I had never been horseback riding that wasn’t on a trail or premeditated route so it was amazing to have control over the horse. And once again I’ll mention how amazing they are. It was a wonderful vacation and I enjoyed the warm weather so much. After getting back to New York I bought a Sigma lens for my camera. Sigma lens are a hit or miss, but I tested it out on my Canon and liked it. I bought the 28-200mm lens secondhand for $30, and I cannot wait to take it out on a photowalk one weekend when the weather has cleared up here. I did a lot of writing in Arizona, bought an ocarina at the RenFaire, and spent the most time I’ve spent with my brother in the eight years he’s been in Arizona. I’m so incredibly proud of him and his fiancé and will be so happy to return next year for their WEDDING. Hopefully spring is right around the corner as I am beginning to feel stir crazy again. Check out my Featured Publications 2015 page for my most recent clippings, as always! When I first arrived in Italy, the stalks of corn were just below my knees, now my head is tilted back just to see the tops. When I first arrived in Italy it was an American holiday, Memorial Day, and I return on the eve of another, Independence Day. I have been shown a piece of Italy that is often looked over in the travel books and in the account of passerby’s. The house that my father grew up in still stands, but only as a shell of the home it used to be. The island where my mother’s family hailed from enchanted my mind. 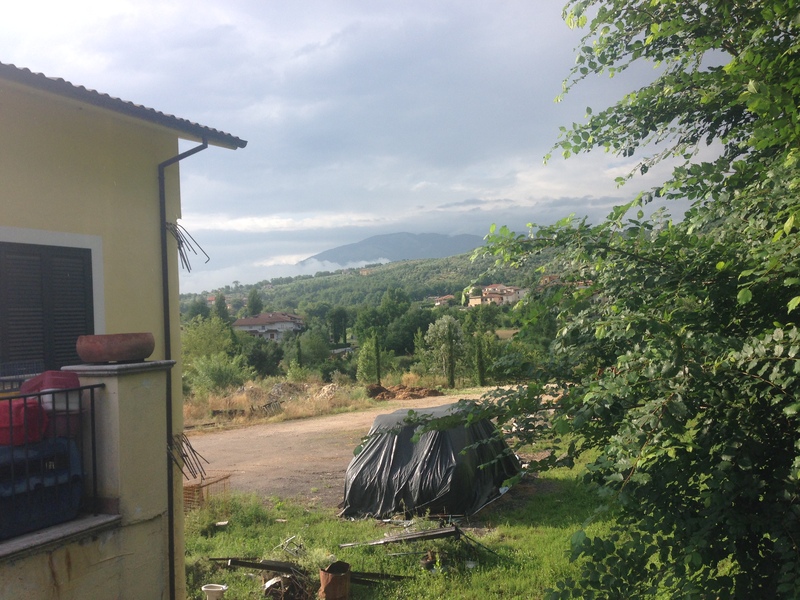 What had started out as a semi-spontaenous trip to Italy, with plans to explore the alternative life of organic farming under WWOOF, took a turn, and instead I learned what it is like to live day-in and day-out in the suburbs of Italy. There’s hard work to be done but it was always rewarded with spending time with the people who matter in life, eating and drinking delicious foods, and trading stories and ideas into the late nights. I did things that I do back at home, like bowling and billiards, but also did things I would have never done back in the States such as riding on a scooter and mixing my beer with Coke. Moments of reflection each day were spent with a fresh cup of hot espresso in hand. I saw a nation propelled with excitement for the World Cup, and witnessed their devastation with the failure to advance out of group. I made friends with people I could only hold small conversations with. I did and saw so many things that it causes my heart to ache just thinking that it will be a long time before I get to feel the same way again. 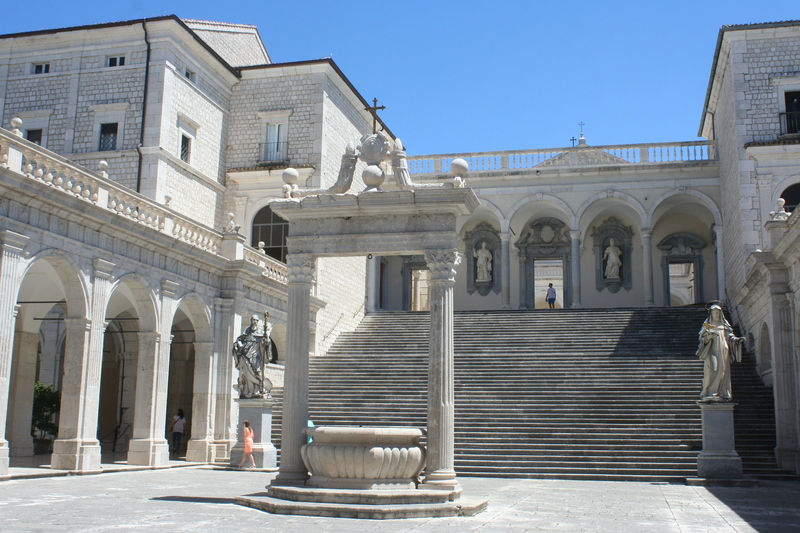 Today we visited the Abbey at Monte Cassino. It was a very fitting place to visit on my last day.The abbey has a long history, but in the more recent span of its life it is known for a large World War II battle that took place there. The abbey sits atop a mountain, and the road there had plenty of hairpin turns and overlooking cliffs. But the ride was worth it with the view at top. We got there a bit late, about a half hour before they close the abbey during the week so we didn’t see everything. What I did see was beautiful. 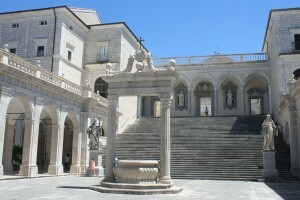 The courtyards were mostly white stone accented with a green garden. There were a few doves perched on the rafters. After our mini-tour of the abbey we went to the nearby Polish cemetery. As mentioned before, there was a big WWII battle here, which you can read all about on the Wikipedia page. And so, tomorrow I believe before dawn for the airport. Through the next couple of weeks I’ll be editing my blog posts about my trip and probably adding a few posts reminiscing about my time here. 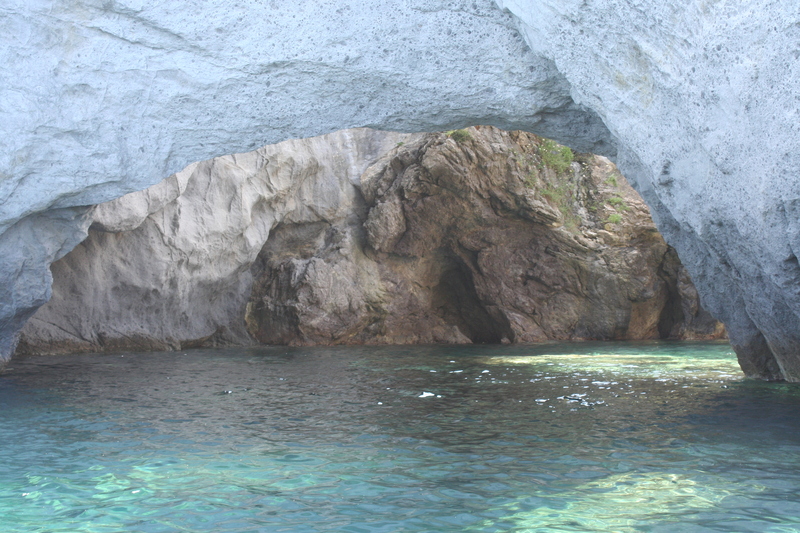 I have spent my whole life looking at pictures hung up on walls or pasted into photo albums of the Isola di Ponza, the small volcano-created island located about 20 miles off the coast between Rome and Naples. I have spent my whole life hearing stories of its beaches and how soothing its waters are. And I finally got my chance to live inside the pictures and the stories. And now I have my own to share. We woke up at 6 a.m. and were on the road by 7. Some traffic set us back and after we found parking, we sped-walked to the docks in Terra Cina (a city close to Sperlonga and Napoli). We quickly purchased our tickets for the ferry and scrambled to make it on board on time. The ferry undocked only five minutes later. The ride was close to an hour long. It gave me plenty of time to reflect on what today would mean for me. I kept recalling a blog post I read the night before by my favorite musician Gerard Way. It’s entitled ‘The Happy-Sads’, and in it he discusses how his depression gave him a view on life that while he could experience happy occurrences, he still felt sad. I was happy because I had been dreaming about this day for so long, but I felt the sadness too. I was nervous that the island wouldn’t live up to the expectations I had for it. I was nervous that after seeing the island, would I still see my beloved Italy in the enchanting mysterious way I have always seen it? And, could I ever feel this happy again once I returned to New York? Italy has been completely amazing and I fear my life back at home will pale in comparison. Overwhelmed with these thoughts I teared up a bit and I was very grateful to already have my sunglasses on. I didn’t have much of a view from the windows of the ferry to see the island before we arrived. 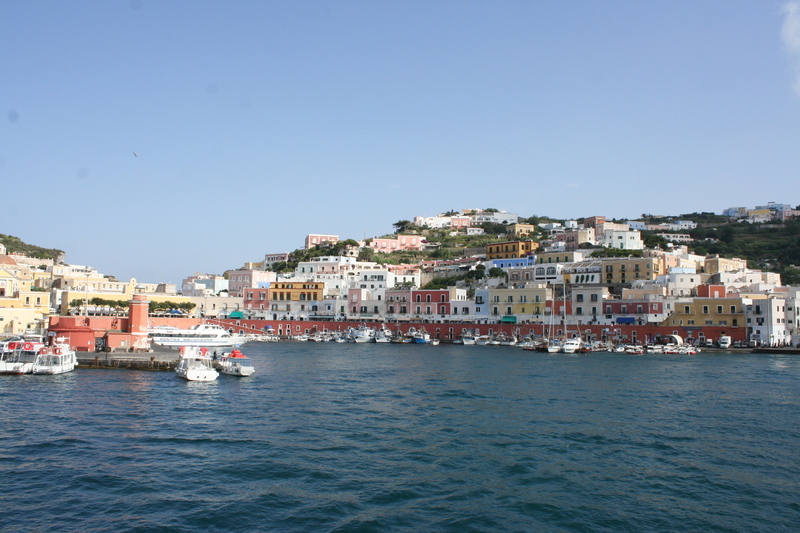 I had seen the neighboring uninhabited small islands, but not the lovely spread of Ponza. When I stepped down the plank, it felt like I had to twirl around to take in everything. On my right side were docks and a swimming area, on my left there were bright pastel-colored buildings and homes slowly ascending a hillside, and in front of me was a little bustling street filled with people and taxis and bursting with life. I could have spent all day standing there and watching the world revolve around me, but my feet knew to follow my cousins along the street until we came about a little shop next to a pedestrian tunnel. There the four of us rented two scooters to easily move about the island. I have never been on a scooter before and I must have looked a little silly clutching the sidebars so tightly, but, my goodness were they so much fun. We sped up an down the the curvy hilly streets with ease and finally stopped at a set of stairs. We parked the scooters at the side of the rode and then ventured down these stairs. Marked every so often in paint was the word ‘Piscine’ accompanied by an arrow. ‘Piscine’ means ‘pools’ in English, and we followed the arrows to Le Forna. It was quite a walk down all these steps, but it offered some fantastic views of the ocean and some glimpses into the lush wildlife and little lizards of the island. Le Forna is a region of the island and this beach is just one of them in the area. We placed our towels on rocks, changed to our bathing suits, soaked up a little sun before taking a dive into the incredibly beautiful water. Is the water blue, or is the water green? I have no idea how to respond to that. But it’s clear and clean and the water felt unlike any other ocean I’ve dipped it. It was smooth and the water didn’t weigh you down. 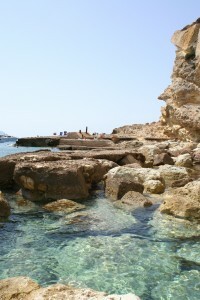 We swam right by a grotto and some caves, but I didn’t go too close to them. In the water you could see little fish hanging about in schools and small crabs scuttling about the rocks. It looked so peaceful under the water. We spent a few hours at this beach sun-bathing, taking short swims, and even ate our pre-packaged lunches. My cousins asked what I so far thought about Ponza and I stammered in my rugged Italian that I didn’t have the words in either Italian or English to describe its beauty. A little after midday we packed up our sets, walked up the insane amount of steps, and jumped on the scooters again. We drove to another beach, I believed called Achilles and Lucia. This beach was very rocky and rough but we did manage to find a spot to lay our towels down, although we were a bit uncomfortable. I didn’t go in the water here because there were sea urchins on the rocks and they were difficult to see so I didn’t want to accidentally step on one or brush up on one. We stayed here for about an hour and a half, enjoyed some fruit and then finally returned to our scooters once more. After we left this beach we took our time driving and stopped intermittently to take pictures of the scenery. The flora and fauna of the island juxtaposed with the multi-colored ocean was unlike anything. Simply divine. We returned to the port area, brought back our scooters and bought some gelato at a nearby gelateria. 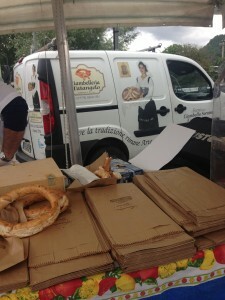 I had nocciola and frutta di bosco. A little weird considering nocciola is essentially Nutella and frutta di bosco is mixed fruits but it was delicious. The nocciola flavor was exceptionally savory. We didn’t have any time to look at the other shops before boarding the ferry and I was a little miffed I couldn’t buy any presents for anyone, but I guess my pictures will have to serve as the only tangible souvenirs from the island. One day is not enough to experience the 2-mile Ponza. But on the other hand, I don’t believe a whole lifetime would fulfill it either. I made a mental note to scold my family later for ever leaving a place like this. 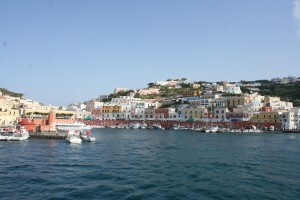 I will be back one day Ponza, the island can be sure of it. No I did not drive. The Island of Ponza as we departed. I wonder what it is about Rome that has me so mesmerized. 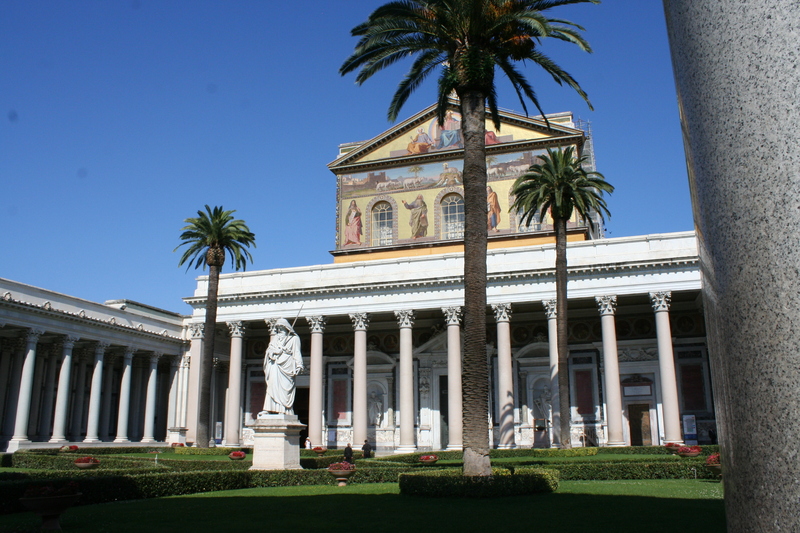 Something inside me surges when I’m in Rome, and when I leave the Eternal City I am left feeling very barren. 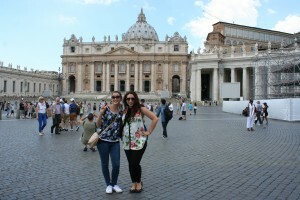 Today my cousin and I took a day trip to Rome. We woke up at 7, which was a bit difficult to do since I was out after midnight playing billiards. We did manage to leave the house before 8, and drove to the train station in Frosinone. 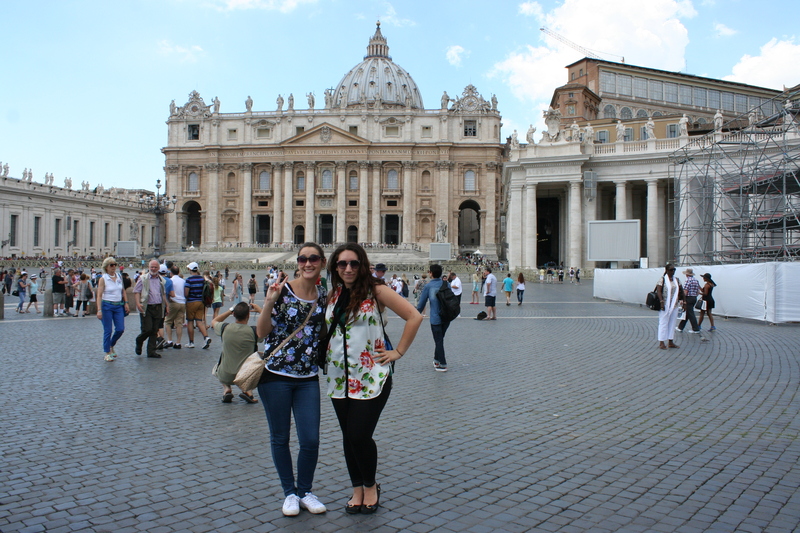 She had some business to attend to in the morning, but after that we spent the rest of the day free to explore Roma. What’s interesting about this trip is that I got a chance to see lesser-known attractions in the city. We started at Circo Massimo, popping out from the subway station right next to it. After getting my fill of the ancient remains of the chariot-racing stadium, we had breakfast across the street. I had a perfect cappuccino and a croissant with Nutella filling. You know you’re jealous. 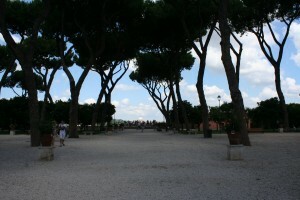 We visited St. Peter’s square, La Passeggiata del Gianicola, Parco Savello (Garden of the Orange Trees), San Bonifacio e Alessio, La Basilica di San Paolo Fuori Le Mure. Across the street from San Bonifacio e Alessio there is a green door and you will mostly likely see a short line standing in front of it. The person at the front of the line is stooped over with their head leaning against the door, and maybe a hand or two cupping around their eyes. There is a small hole in the door, and when you look through it the first thing you’ll notice is something bright at the end of your vision. 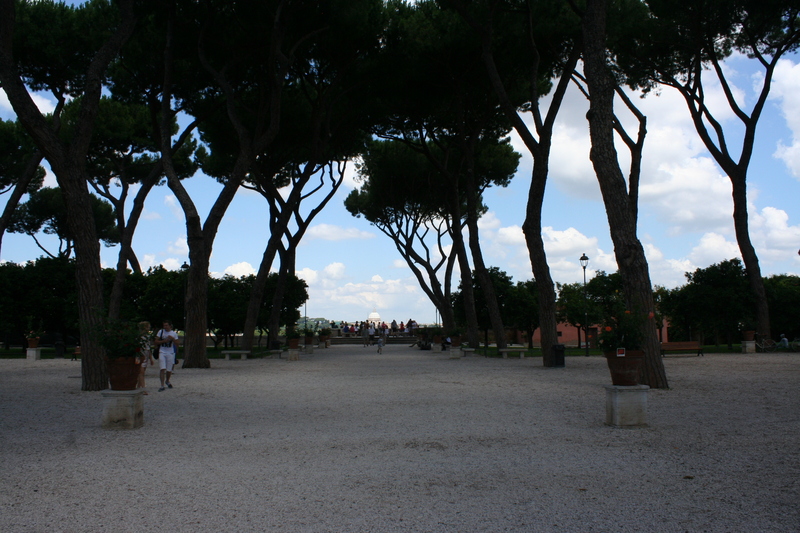 Surrounded by a garden of bushes, and far off into the view is the perfectly centered dome of Saint Peter’s. It’s no wonder why Rome is so well-suited for its modern-day life, it’s because it’s completely embraced its history and preserves it in these little ways. If you’re ever in that area, stop by that big green door and take a peak. 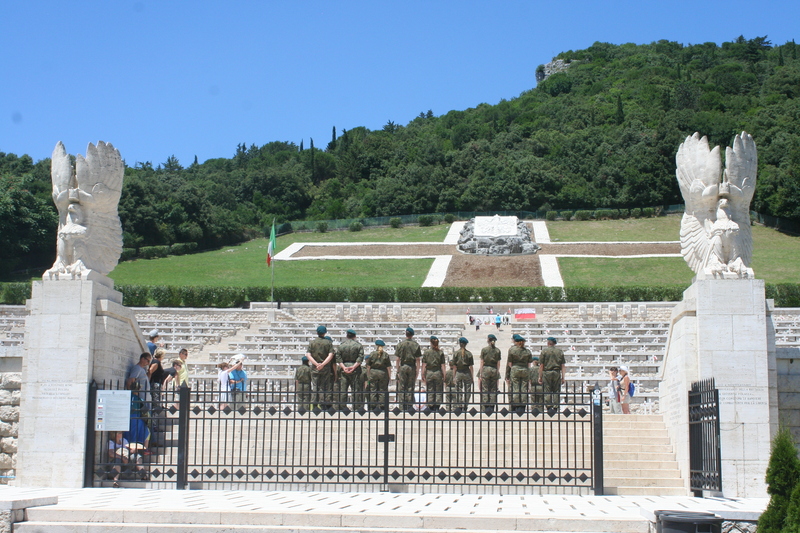 Also to note, one of my favorite things about today was a monument at La Passeggiata del Gianicola. While that area has amazing views of Rome, there is an inscription on the bottom of the monument for Giuseppe Garibaldi in the center that I became fixated on. It simply said ‘Roma o Morte.’ Rome or death. And I get it. I explained to my cousin that one day I want to live in Rome. Not wish to, not maybe, I made sure in my limited Italian to pound down it as a statement. One day I will live in Rome. I don’t think I’m ready to in my life, but I don’t see my future without it. So, to wrap it up, today was another fantastic day. It was fun criss-crossing the city on the trains, walking around parts of the city that sanitized of tourists. It was nice buying lunch at a supermarket. Today almost felt like the antithesis of a day you’d expect to have in Rome. But for me, it was perfect, I did as the Romans did. 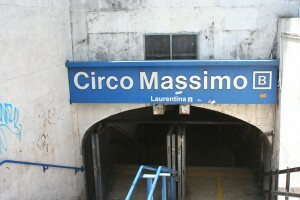 The subway entrance for the Circo Massimo stop. 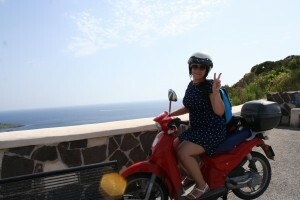 So I had another lovely weekend after my visit to Napoli. The only downtrodden thing was Italy losing their match against Costa Rica on Saturday. We’ll rebound against Uruguay tomorrow. After the match, we had dinner, and then I showered. We took in a trip into Sora to see them setting up l’infiorata, which is a traditional festival before Corpus Christi (Corpus Domini). 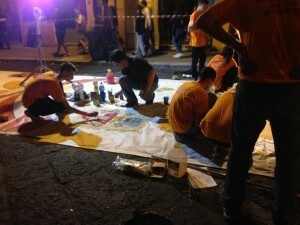 There were people creating street art with flowers and vegetables depicting biblical scenes. There was also a large stage set up in the piazza and they had little kids singing songs and it was really wonderful. 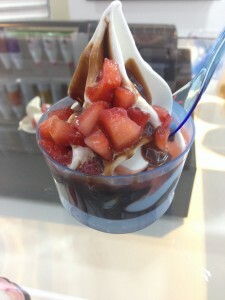 I also got to try Italian frozen yogurt. I chose Nutella syrup and strawberries as toppings. Let me tell you how great of a decision that was. 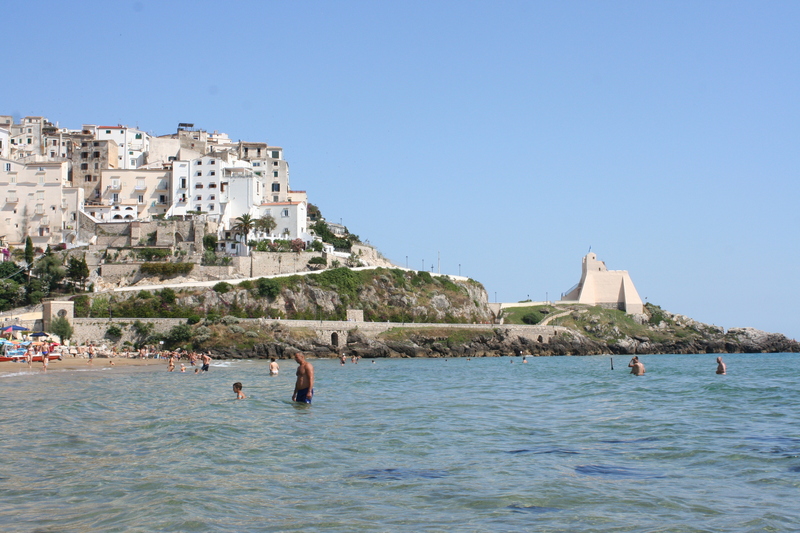 On Sunday we headed back to the charming seaside town of Sperlonga. I bought a bathing suit right on the beach for 14 Euro. Not a bad price at all. The top fits perfect but the bottom is a little small. That’s okay because I like to mix and match my bathing suits anyway. My time here is beginning to wind down. I feel it. I leave on July 3rd, so I still have plenty of time to soak in the local sights and culture. But, I already feel that sadness seeping into my mind. We were driving back from the beach and I was looking at the mountains against the sunset and I got a bit teary-eyed. These sights have become so precious to me and I know I will miss getting to stare and revel at their beauty. I am envious of this life. On the 28th, my cousin and I are going to Ponza for three days. 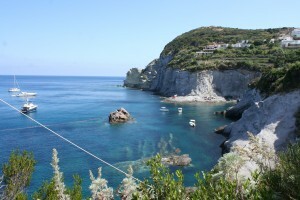 The island of Ponza is where my moms side of the family originated from. They all moved to New York in the early 1900’s. I’ve heard varied stories as to why but the one that interests me most is the one where they were targeted by the fascist party and left to avoid capture by Mussolini’s camp. The island of Ponza and the neighboring island Ventotene served as political prisons for opponents of fascism. 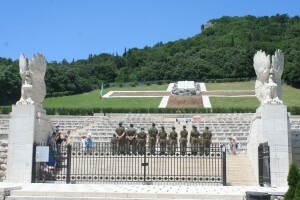 Mussolini himself was imprisoned on the island for several weeks after he was overthrown in 1943. But that was much after my family had left. I’m so excited for this trip. I won’t rush through the week though because I know how short my time is running. 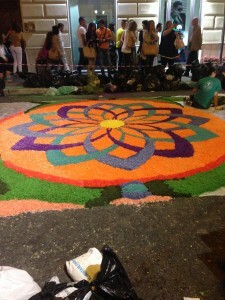 People assembling the flower art! 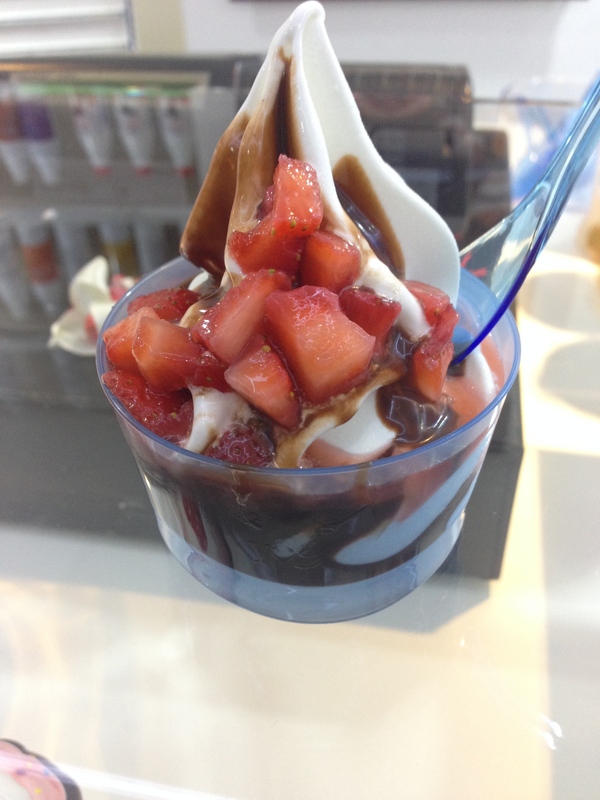 Frozen yogurt with nutella syrup and strawberries! 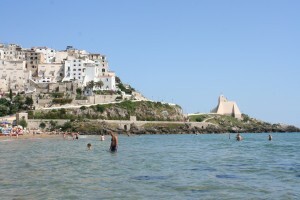 And here’s another picture of Sperlonga in case you forgot how gorgeous it was from my post a few weeks back. Everyday has been spectacular here in Italy, and yesterday was another day of pure bliss added to that. 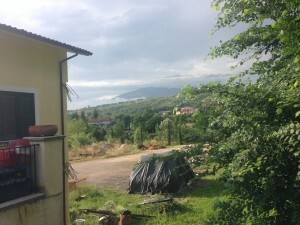 We left in the morning to my cousins boyfriends house a few towns away and made our way south to the town of Caserta. I asked what we were doing here and the reply was La Reggia di Caserta. I didn’t know what ‘reggia’ meant at the time, so I quickly resorted to a translator. Reggia means Palace, and this place was nothing shy of elegance, extravagance, and immense beauty. 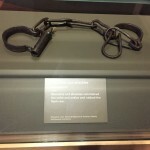 As a bit of a history buff I was disappointed I didn’t know about this place prior. However, I am happy to report I am caught up with its historical context and will impart some of my newfound wisdom to you as well. 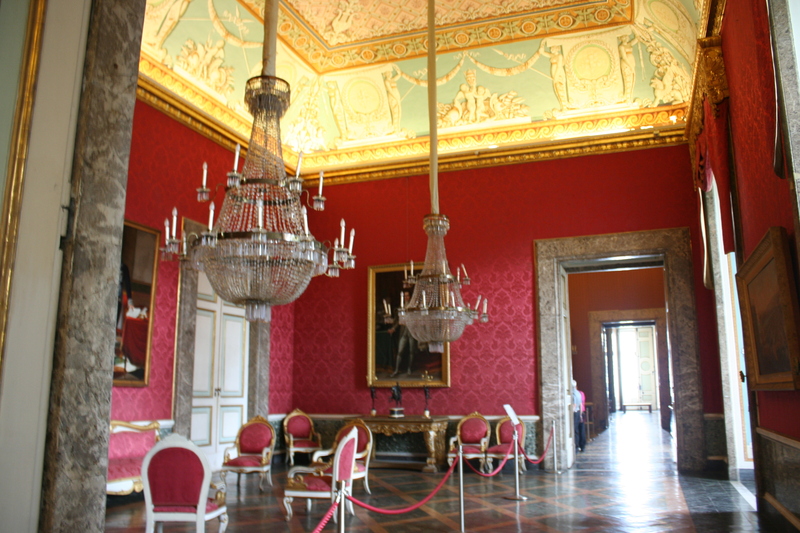 The palace was built in the 1700’s under the oversight of Charles VII of Naples and his architect Nicholas Vanvitelli. 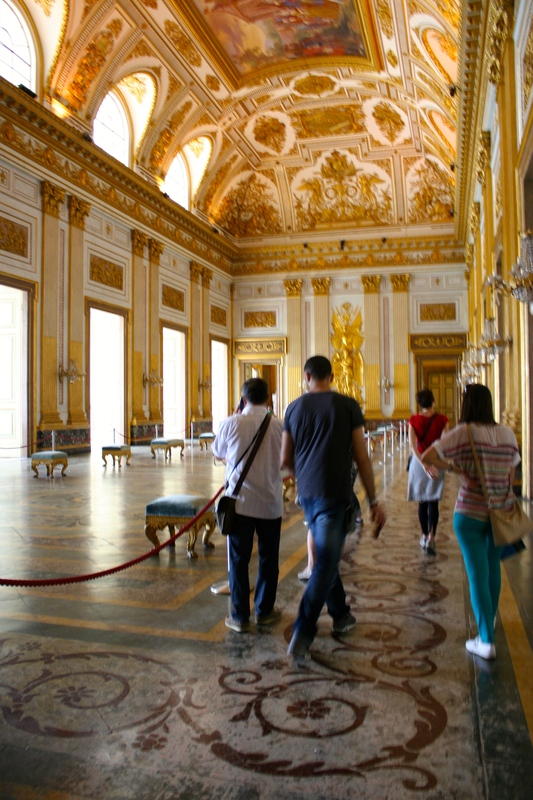 This Baroque period palace was never slept in by Charles VII, as he left to abdicate as the King of Spain in 1759. The palace was handed over to his son, Ferdinand IV. In terms of volume, it is the largest palace in the world. We started our tour at the gardens. It took a long time on this muggy day to walk all the way to the end but seeing The Fountain of Ceres, The Fountain of the Dolphins, The Fountain of Aelous, The Fountain of Venus and Adonis, and the Fountain of Diana and the Actaeon was well worth it. At the last fountain, the Fountain of Diana and the Actaeon, we enjoyed some ice cream, sat in the shade, and took the bus back to the palace. 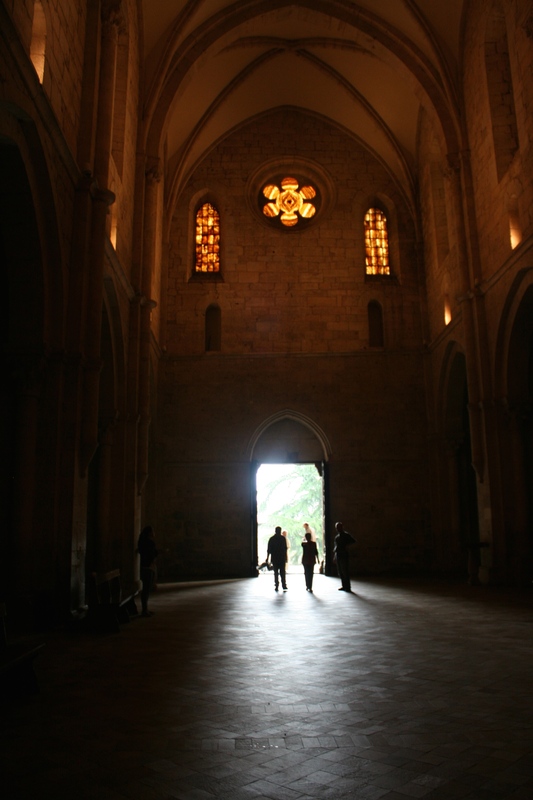 First we visited the chapel, lined with gold and structurally fortified with grey and pinkish marble. Magnificent. We then ventured to the art gallery, which featured classical paintings from that time and also modern/contemporary art. After a stroll through the gallery, we set our eyes upon the stunning apartments in La Reggia. Each room toppled the next one. The vaulted ceilings, the smallest detail-laden trinket, each room was magnificent. And there were so many of them! The Throne Room. One of the largest rooms The Throne Room is open, airy and is tied together with an insane gold vaulted ceiling. It cries opulence. The lack of furniture in the space is also really appealing. The Honour Grand Staircase. As mentioned before, it elevates you to a whole new place. I don’t know how I didn’t trip on the stairs when I just kept looking up and around. 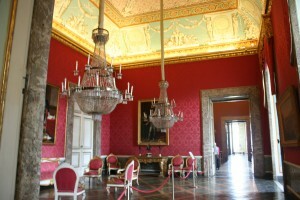 The Second Antechamber of Joseph Murat. Probably my favorite out of all the rooms, the ruby red wall paint got me, and it had that lovely Victorian-esque design I adore. By the way, who even needs one antechamber? And this guy had at least two. 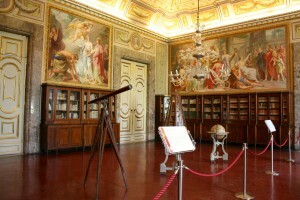 The Third Room of the Library. Expansive, filled with old books, globes, a telescope, what more could a bibliophile ask for? The dark wood also set itself apart from the rest of the rooms. I can go on and on about how stunning this place was, but I hope I’ve said enough that if you’re ever in the Napoli area that it is a must-see. After La Reggia di Caserta we headed to Napoli. 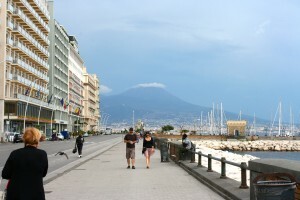 We walked around the historic center, the seaside, and gazed at the menacing-look Mount Vesuvius. I still can’t believe I saw a real volcano. Napoli is charming. However, I must say as we were driving through the port looking for a parking lot, the driving there is certifiably insane. It’s like all the rules of driving are out the door. No lanes, scooters zipping in and out, cars turning from the left to make a right. I don’t think I could have gripped the car seat tighter than I did. We visited Piazza del Plebiscito, I saw the most important bar (cafe) in Italy there. It’s called Gambrinus, and it is where the President of Italy buys the first coffee of the New Year. After getting our hands on some delicious Neapolitan pastries we took the car back to the old part of town for a few more hours of walking and wandering. We went to the Naples Cathedral where the crypt of San Gennaro is. We visited the famous streets of the nativity and also musical instruments. Then, at around 6, we headed over to Sorbillo’s and after a ten minute wait I had the best pizza I have ever had in my life. Nothing could seriously top it. Ah, so here I am again skipping days with my posts! We shall begin the catch-up where I left off last time: the World Cup! We gathered for a big dinner around 10 p.m. on Saturday for the match between England v. Italy. We had pizza, cured meats, vegetables, and plenty of Moretti beer. When we were stuffed, we were joined by more guests where we each took a seat in the living room. We were supposed to watch the game outside, with the projector, but my cousins couldn’t get the audio to work. It was exhilarating to have people around me so invested in this match. I have always enjoyed the sport, and have been a fan of the Azzurri team ever since I could remember, but it was a special moment for me in that room. I was surrounded by electricity, the intrinsic passion for the team. It was intoxicating. If you watched the match you know that it was a nail-biter. But the Azzurri came out on top for their first 2014 World Cup victory. The game ended at 2 in the morning here, and although very tired I stayed up until 3, which made for a very sleepy Sunday. 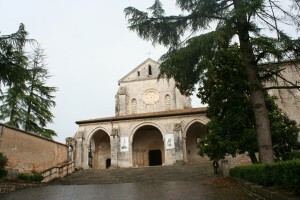 Monday morning my cousin took me to the Abbey in Casamari. Casamari is a neighboring town and the abbey there is almost a thousand years old. It was built in 1035. The church was preparing for some festival this weekend. Gorgeous church, vastly different from the ornate churches that sprinkle Italy’s big cities. I enjoyed seeing it. After visiting the Abbey, I asked my cousin if we could stop at a bookstore. I am a big Harry Potter fan and the idea occurred to me that it might help me learn Italian faster/better if I read the first book in Italian. I know Harry Potter so well that I could add context to the words and focus on the grammar and technique of the translation. The first bookstore we tried didn’t have the first book, so we went over to neighboring Carnello (the town my dad was born in) and I found the first book there. From there we stopped at the school my aunt teaches at. The school year just finished so the elementary school was being cleaned out. It was so tiny! What an interesting thing to see in a foreign country. I then spent most of my afternoon translating words from the Harry Potter book. It’s taking longer than i thought because when books are written in Italian they use a special tense, and I’m not too familiar with the rules of the tense. I hope to complete the first chapter and then reread the first chapter fluidly. It’s still enjoyable and that air of whimsy that J.K. Rowling is perfect at seeps through even in the translation. In the late afternoon we brought the white kitten who I’ve posted plenty of pictures about, to the vet. Another place you wouldn’t find yourself as a tourist going to. There was no receptionist, and the office just had dogs hanging about in corners and whatnot. The wait was quite long. We brought the kitten to the vet because he has a cold. The vet examined him, took his temperature, gave him a shot, and told us to come back on Wednesday for a second shot and check-up on his condition. Later in the evening we watched the Ghana v. USA game. I was so tired that I decided to get ready for bed 15 minutes before the game finished, so essentially I missed most of the action. At least I kept checking Twitter for the updates. USA won 2-1. As today is Tuesday, in the morning my cousin and I visited the market again. I bought some souvenirs for my friends and because I’ve accumulated so much change I offered to pay for the ciambella. I still have plenty of change. After lunch I helped my cousins wrangle the other set of kittens, the smaller ones. I believe they were giving them away. So that’s it for now. 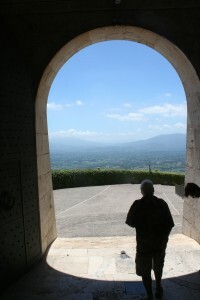 I heard talk that I may be going to Monte Cassino soon, but I am uncertain. Enjoy the pictures as always! Where we got the ciambelle from! You can see one in the left corner.